About to buy a used car in the near future and have been considering a 2005 Chrysler Crossfire or a 2010 Hyundai Genesis Coupe. Recommendations? Thoughts? Will be using it mainly for commuting to school and work. I owned a 2004 Chryler Crossfire for about a year and a half. I bought it used. This is the only vechicle I've ever bought based strictly on its looks. Even though I no longer have it, I still think it's one of the most beautiful cars ever made. People would stare at it. It was in nearly mint physical condition, ran like new when I bought it and had very few miles (less than 20k). But it was an absolute nightmare to own. It developed a mysterious misfire that no one could diagnose, and what felt like a fuel pump problem that similarly no one could diagnose. It would become undriveable in moderate to heavy rain, even though, once again, no one could figure out why it misfired to the point of stalling in this type of weather. I was fortunate enough to find an independent dealer who had experience working on Crossfires...but even he could not diagnose and correct the problem. The car also developed a vibration at around forty miles an hour that had to be tire and/or wheel related...even though the wheels and tires were all checked and rebalanced, and even though they checked out as properly balanced and did not exhibit any other issues. The car also had the well known and common, sometimes-won't-shift-out-of-park-problem. All of this forced me to give up on it and sell it. But it was a gorgeous car. I owned a leftover-new 2005 SRT-6 Coupe from 2007 to 2010. This is would be a terrible car for someone with only one car. Though gorgeous, and wildly fast in a straight line, the car is cramped inside, has terrible sight lines, rides like it has no suspension, takes crazy expensive tires, is virtually an exotic car when it breaks and suffers from poor factory support. It it was a poor third car for me. 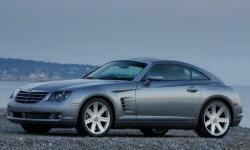 Crossfires have a Mercedes Benz drive train and subframe based on the SLK. Reliable but expensive to maintain. I owned a Crossfire Limited for several years. I had zero, nadda, issues with it. It ran great and gave me no problems at all. It is a small car with limited room to put things in. It is not for a tall person. The car is short with a firm ride so it doesn't like rough roads. I had the Michelin Pilot tires on it which were noisy and crazy expensive to replace. I think it is a cool looking car and I enjoyed owning it. If you look at buying a standard make sure the shift into second is working properly. My car was notchy going into second, especially when cold.